The city of Cape Coast was one of several trading posts established by Europeans along the so-called Gold Coast in the 16th and 17th centuries. After the Portuguese established a fort in the area, the Swedish Africa Company obtained permission from the King of Fetu to set up a lodge called Carolusborg in 1653 which was built and overseen by an adventurer called Hendrik Carloff. Carloff became embroiled in a legal dispute with his backers, left the post and switched allegiance to the Danes in 1657. heading an expedition later that year which captured Carolusborg within just two days. Carloff had been an employee of the Dutch West India company and left another former employee, Samuel Smit, in charge of the fort after his departure in 1659. Dutch government agents were able to convince Smit that the Swedes had conquered Denmark and that he should hand over Carolusborg to them. The King of Fetu refused to allow the Dutch to take possession and sold it back to the Swedes instead, but his death in 1663 left the Dutch free to occupy it. Which they did, but only for a year – the English forced them out in 1664 as one of the hostile acts leading to the Second Anglo-Dutch War. The English, and after 1707 the British, remained there right up until independence in 1957, although their Gold Coast capital moved to Accra in 1877. 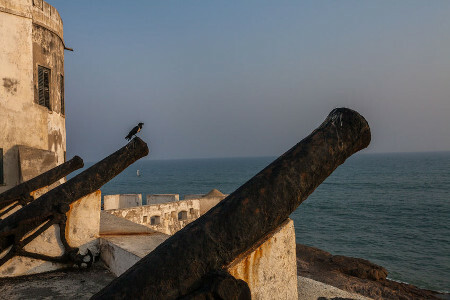 Cape Coast was also where large numbers of African captives were held before embarking on the notorious “middle passage” of the Triangular Trade across the North Atlantic, from Africa to North America and the Caribbean, where they would be sold into slavery. Dungeons were built at the Castle that could house hundreds of captives at a time. Today, the Castle and Dungeons are a UNESCO World Heritage Site. This entry was posted	on Sunday 30 September 2018 at 11:43	and is filed under 2018, British Expat Latest, Ghana. You can follow any responses to this entry through the RSS 2.0 feed. You can leave a response, or trackback from your own site.